Rich and nourishing, Shea butter helps moisturize dry skin associated with eczema and psoriasis and is known to diminish the appearance of stretch marks. I really like this soap. I cut the bar in half and use half by the sink and the other half in the shower. It doesn't dry out my hands like a lot of other soaps do. Smell is pleasant as well. really soothing spa smell, very gentle on the skin, but it doesn't lather well, need to scrub harder to have some foam. won't buy it again. The nicest soap I've used. 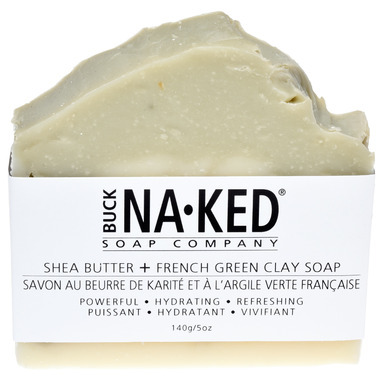 I've tried L'Occitaine and others and I like Buck Naked best! I love the how it soaps up. But I wish it smelled a ltitle more. Or the company come up with more intense version for it. This soap is nice and silky with a pleasant spa- like scent that lingers in the bathroom after use : ) I love the natural ingredients, and that it's a substantial size, but the shape (although pretty) and the slickness of the soap when wet make it difficult/awkward to hold on to when showering because it's so large. I didn't want to risk cutting it in half or thirds because I didn't know whether it would then break apart into smaller bits. I absolutely love this soap. The lather is sooo soft and my dry skin feels less itchy. I would buy this again. Love this company's soaps and the Shea Butter is probably my favourite! 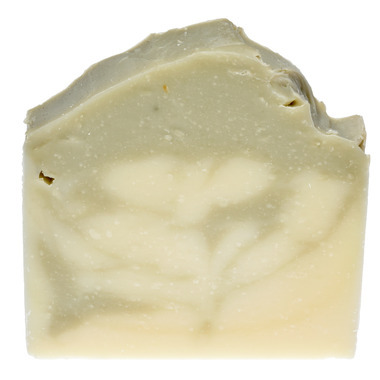 It's creamy, moisturizing and has a great spa-like scent that subtly freshens up the bathroom. I love that they're all vegan, natural and still work up a good lather!